I was craving my Mom’s beef stroganoff recently but as I’ve mentioned in other posts, the husband and I aren’t eating wheat or dairy much these days so I didn’t want to make a dish that uses both and feel bloated for days. I also didn’t feel like driving to the grocery store (a common problem when you live in the boonies like we do) so I used what I had on hand. Zucchini & carrots for noodles and I had some homemade df & gf sour cream on hand. It would have to do. It did awesomely! The picture I took with my phone doesn’t do it justice. It was delicious, creamy comfort food and it will be going in to our rotation on a regular basis. You should add it into yours too, especially if spring continues to keep her distance! Also, this is tasty enough to serve to people who eat dairy & wheat but are looking for something a little lighter – I promise! Heat the olive oil in a large skillet or dutch oven over medium heat until hot, then add onions, peppers (or celery) and mushrooms. Cook until the mushrooms are browned and the onions are slightly soft. Cook the garlic with the vegetables for the last minute of cooking. Remove the veggies from the pan and set aside. While your veggies are cooking, make your “noodles”. Wash your carrots and zucchini well and leave the peel on if they’re organic. Using a regular vegetable peeler (you don’t need a spiralizer or a fancy peeler for this), carefully peel your veggies into long strips. Keep peeling until you can’t peel them any more. You may need to rotate them or lay them flat on a cutting board firmly to get as much peel as possible. These vegetable peelings are now your noodles! Saute the ground beef in the same pan until browned, breaking up with a wooden spoon occasionally. When the beef is just about cooked through, add the mushrooms, peppers (or celery) and onion back to the pan, sprinkle the mixture with the potato starch and stir well. Cook for one to two minutes then add the beef stock, tomato paste, and Worcestershire sauce and cook for 5 minutes or until the liquid begins to thicken. Turn the heat source off and stir in your cashew cream (or use sour cream if you eat dairy). Season with sea salt and black pepper to taste. Stir in the “noodles” or serve the stroganoff over the noodles depending on your preference (I like to stir the noodles in to take the chill off so they’re warm). Serve with a sprinkle of fresh parsley and some smoked paprika if you like. 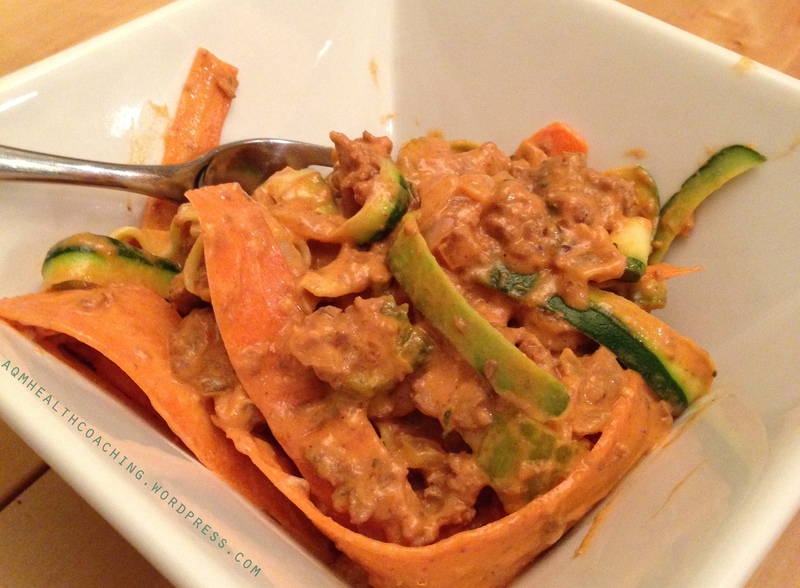 This entry was posted in Dairy Free, Gluten Free, Recipes and tagged comfort food, dairy free, entrees, gluten free, grass fed beef, nuts, recipe, recipes, stroganoff on March 31, 2014 by Andrea Quigley Maynard.